A complete tour exploring Tokyo: its most picturesque corners and most important historic and religious buildings illustrating the culture and traditions of this magnificent capital that is both ancient and modern at the same time, with an enchanting magical atmosphere. 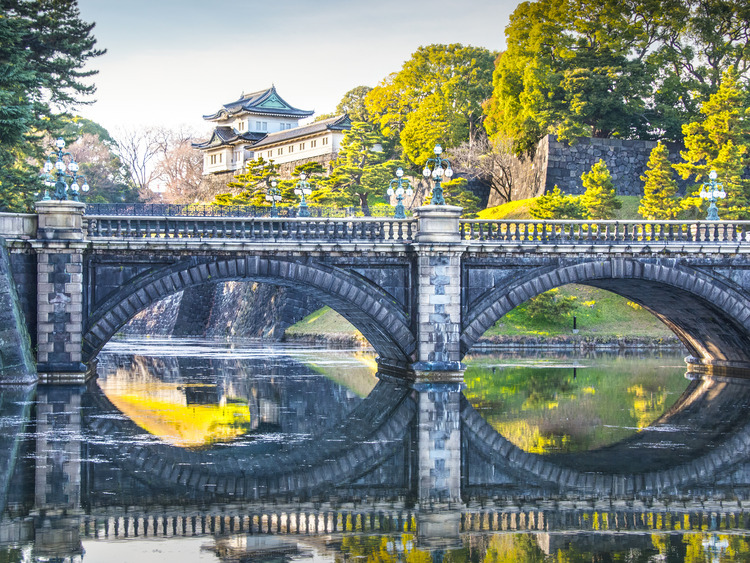 When we reach the capital of Japan, our tour will begin at Tokyo Imperial Palace (Kōkyo, literally "imperial residence"), the main residence of the emperor Japan. Formerly known as Edo Castle (because Edo was the previous name for Tokyo), it is still surrounded by its original moat, and imposing gates and ancient watchtowers can still be seen along the walls. The area contains many buildings dotted around a vast park. These include the main palace (Kyuden), the private residences of the Imperial family, an archive, a museum and the administrative offices. We will enter the park where we can admire the Sakuradamon gate, which literally means “gate of the cherry blossom fields” and Nijubashi bridge, an elegant two-arch bridge leading to the main entrance. Then we will head to the historic district of Asakusa, the oldest in the capital, where we can experience Tokyo’s unique atmosphere where the spirit of tradition lives on. The main attraction in the district is the Sensi-ji Buddhist temple, built in the 7th century and dedicated to the Buddhist goddess Kannon, who is very popular in Japan and incarnates compassion. With its millenary history, this temple is the oldest and most important in the city and greets visitors with its imposing flame-red pagodas. Once we have entered, we will travel along the famous*Nakamise-dori*, a 230-metre road lined on both sides by many little shops selling typical Japanese products.